In response to the security, political and socio-economic crises that currently plague Nigeria amid a seeming recurrence of incompetent persons being elected into political offices, like-minded organizations are partnering to host a gathering termed the: “Summit of the Alternatives” (SOTA). 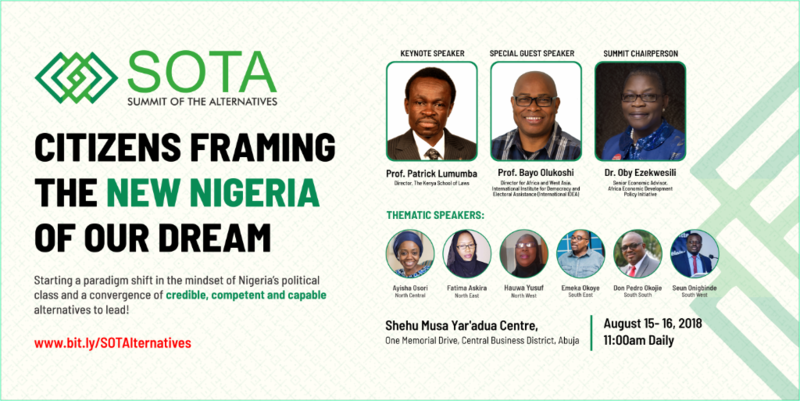 “SOTA” will start a paradigm shift in the mindset of Nigeria’s political class and a convergence of credible, competent and capable alternatives to lead by developing a framework for the right political system that crafts the Nigeria of our dream. Attend SOTA on August 15 & 16, 2018, at Shehu Musa Yaradua Center, Abuja. You need to REGISTER now to attend! Summit of the Alternatives is a partnership between BudgIT, CDD, EiE, Nigeria First, Red Card Movement & YIAGA. Tags: Budgit, CDD, EiE, Nigeria First, Red Card Movement & YIAGA.